Escaping the rat race and living on a smallholding is the lifestyle dream of almost half the population (47%), a survey conducted by leading rural insurer NFU Mutual reveals. For most of the people wanting to become smallholders, the main reasons are: living more sustainably or becoming self-sufficient (58%); having a healthy life style (54%); a great way to spend retirement (50%); and the opportunity to live in the countryside. Other reasons for wanting a smallholder lifestyle include: a better way of life for my family (39%); returning to countryside roots (27%) and being able to combine their profession while running a smallholding (16%). When it comes to turning their dreams into reality, 44% say they are unable to make their dreams come true because of the high costs involved in buying and setting up a smallholding. Realising that running their own piece of land can be tough, respondents say they would be deterred from that lifestyle because of: workload (22%); pressure dividing time between smallholding and family life (21%); having to learn new skills (20%). These warnings are confirmed by existing smallholders, with only 24% reporting that their land generates an income. Chris Walsh, farming insurance specialist at NFU Mutual, said: “It’s great to see that so many people yearn for a simple country lifestyle in our fast-paced 21st century world. “With the New Year bringing a fresh opportunity to pursue dreams and make resolutions, the lure of the countryside seems to be front of mind for many. “However, as the UK’s main rural insurer, protecting thousands of smallholdings from the perils of fire, storm, floods, accidents and livestock diseases, we’re well aware of the need for people to think carefully before taking the plunge. Rosemary Champion, who runs a smallholding with her husband in Scotland and has attracted a wide following for her Accidental Smallholder blog, said: “A smallholding is the dream for many, including myself – being self-sufficient with a few acres in the countryside and looking out at a beautiful view. But even if you aren’t planning to try to make a living from your smallholding, doing a bit of business planning is a sound investment of time. NFU Mutual estimates there are approximately 45,000 smallholdings across the UK, ranging in size up to around 12 acres. 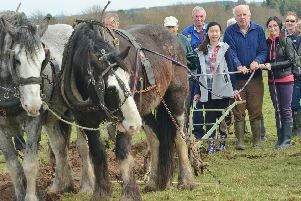 Smallholders with up to five acres tend to focus on growing fruit and vegetables, rearing poultry, keeping a horse or two and maintaining a piece of woodland. Those with 5-10 acres tend to have more grassland for grazing livestock while smallholdings of 11 acres plus often run flocks of sheep, a few cattle, or a large vegetable growing area including polytunnels. NFU Mutual’s website, https://www.nfumutual.co.uk/farming/smallholder/, provides information on setting up and running a smallholding.